We feel the error that most people make when cooking risotto is that they go overboard on the stirring and end up with a gummy blob not to mention making it FAR more complicated than it actually is. We have no idea why! Even our favorite chefs known for making things simple make this a tough one for no good reason. So – here is our gift to you … go ahead and wow your friends and family! Your secret is safe with us. We have given you the Seafood version – but what is equally delectable is a mushroom risotto for those of you that like them or have a vegetarian penchant. 1/2 pound shrimp, shelled and de-veined. You may want to add scallops, clams etc. or even easier get 2 small bags of frozen mixed seafood! Note: We get asked about salt. We find that the Parmagiano cheese is salty enough. Try it first without adding salt. If you find it needs it you can add it after and will know to modify the recipe to your personal liking for the next round. We consume too much sodium, so try and add saffron or a spice instead of salt. 1. In a large pot, bring the stock to a simmer. 2. Meanwhile, in a large heavy bottomed pot, heat 2 tablespoons of the olive oil and 2 tablespoons of the butter over medium heat. Add the onion and cook until softened and translucent (medium heat – you are not browning them! ), 8 to 10 minutes. Add the rice and warm it about 2 minutes. Warming the rice will prepare it to absorb the stock. 3. When the rice is warm it will start to become translucent – that is time to add the stock. Add the stock. Stir the rice gently and return the stock to a boil. Reduce the heat so that the stock is lightly boiling. Stir the rice from time to time to make sure it is not sticking to the bottom of the pan – but as little as possible! If the rice sticks reduce the heat a bit. 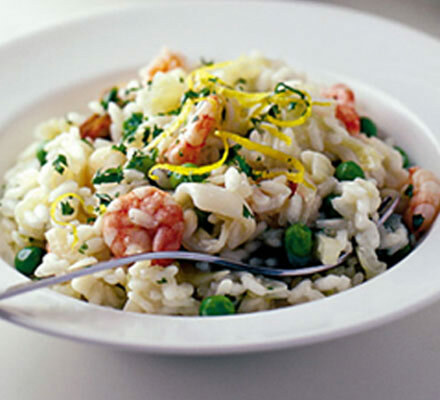 Risotto should take about 20-25 minutes to become soft and most of the stock should be used. 5. After about 20 minutes begin to taste the rice. Risotto is ready when the rice grains are soft, but still a little firm to the bite, not mush and not chalky. When the rice is ready add the seafood and cook 2 minutes more. 6. Stir in the remaining 4 tablespoons of butter and the Parmagiano-Reggiano cheese until well mixed. Transfer to serving plates and serve!!See?? Easy!!! Pingback: Wine – where do you start? » Blog Archive » Alternative for dry wine?